Join us for a reading group discussion of The Lucy Variations by Sara Zarr! Sixteen-year-old San Franciscan Lucy Beck-Moreau once had a promising future as a concert pianist. Her chance at a career has passed, and she decides to help her 10-year-old piano prodigy brother, Gus, map out his own future, even as she explores why she enjoyed piano in the first place. Not Your Mother's Book Club™ presents a night full of newness with National Book Award finalist Sara Zarr, and acclaimed author Tara Altebrando, sharing their glorious collaboration, Roomies--a charming novel about that time after high school, when everything feels like it's ending just as it's beginning. Join Sara Zarr and Tara Altebrando for a reading and signing of their new book, Roomies. Told from the dual perspectives (each one written by one author) of two high school graduates, over the summer before they become college roommates, Roomies is about about that time in life when everything feels like it's ending just as it's beginning. Sara Zarr is a National Book Award finalist for Story of a Girl, and Tara Altebrando is the acclaimed author of The Pursuit of Happiness. Places in the signing line are reserved for those who purchase a copy of Roomies from The King's English. We'll be discussing The Lucy Variations by Sara Zarr, October 24 @ 7:00. Horn Book Guide Reviews 2013 Fall When sixteen-year-old Lucy impulsively quits an international piano competition, she jettisons a deeply-held family tradition, a lifestyle, and her career as a concert pianist. The novel's strength is Zarr's unflinching attention to the gray areas in Lucy's life, where adults are fallible, decisions are reversible, and passions can guide you forward or lead you astray. Join authors Gayle Forman and Sara Zarr as they read from and sign their new young adult novels Just One Year and The Lucy Variations. The romantic, emotional companion to Just One Day, Just One Year is a story of the choices we make and the accidents that happen—and the happiness we can find when the two intersect. Places in the signing line are reserved for those who purchase a copy of the featured books from The King's English. All event titles are 20% off for members during the month in which the author appears at the Politics & Prose. Click here for directions. There is ample parking available in the lot behind the store and in the surrounding neighborhood. Are you tired of feeling ashamed every time you creep into the Young Adult section of BookPeople? Well, the Forever Young Adult Book Club is here to offer you relief! We're a group of adults (technically) who meet at 5 PM the second Sunday of every month. This month’s book is Sweethearts by Sara Zarr, so leave your shame at the door, grab a cocktail, and join us! Sara Zarr signs Once Was Lost. Sara Zarr's book Dear Teen Me: Authors Write Letters to Their Teen Selves was available from LibraryThing Early Reviewers. 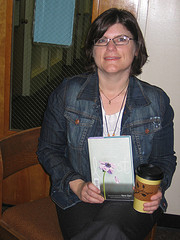 Sara Zarr is currently considered a "single author." If one or more works are by a distinct, homonymous authors, go ahead and split the author. Sara Zarr is composed of 3 names. You can examine and separate out names.